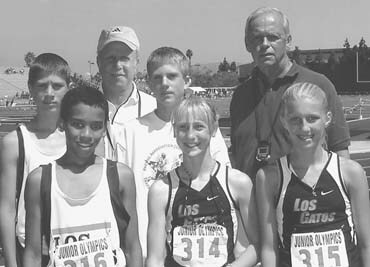 The Los Gatos Athletic Association sent five athletes to the Junior Olympic regionals, and Christine Jones and Hilary May earned spots in the nationals. The team members were (front row, l-r) Brantley Rideau, Jones and May; and (back row, l-r) John Udall, coach Willie Harmatz, Steven Udall and coach Roger Adams. The meet may have been a couple of thousand miles away, but Saratoga was represented at the Junior Olympic track and field meet held in Omaha, Neb., when Hilary May of Saint Andrew's School competed in the 1,500-meter run. May and Christine Jones of the Los Gatos Athletic Association (LGAA) each won places in the national meet by finishing in the top three in their events at the Junior Olympic regionals. Jones, 14, finished second in the youth girls 800 in 2:21.5 to claim a spot in the nationals. She had won county eighth-grade championships in the mile and 800 for Fisher Middle School in May. "Christine has been dropping her times so fast, she is really becoming a star overnight," said Willie Harmatz, a track coach at Los Gatos High School who teamed with Roger Adams of Saint Andrew's to coach the LGAA squad. "She has a great future." May, who attends St. Andrew's in Saratoga, ran third in the 1,500 in 4:57.5 to qualify for the nationals. May, 13, won the seventh-grade county titles in the mile and 800 in the spring, setting new records in each event. "She is one of the best runners in the country for her age," said Harmatz of May, who has recently moved to Corona Del Mar. At the nationals, Jones ran a personal best, 2:21.5, to finish second in her 800 heat, but she was disqualified in the finals for running on the lane line. Jones was eighth in her 1,500 heat in 5:01.0. "Things didn't go that great [at the nationals], but I'm real proud of the two girls," said Harmatz. "It was a great honor for them to make it that far, and it was great experience for them." Brantley Rideau, John Udall and Steve Udall, all seventh-graders at St. Andrew's, also competed for LGAA at the regionals. May was named a National Elite All-American in track and field at Saint Andrew's. She ran 4:59 in the 1,500 and 10:59 in the 3,000 meters to qualify among the top 20 runners in the nation in the 13-14 age division. She shattered the county record in the seventh-grade mile last spring, running 5:20 to beat the old mark by 19 seconds. She also set a new county standard in the 800 meters in her age group, bettering the old record by two seconds. May ranks fifth in the nation for 13-year-olds in the 1,500 and she is ranked 12th nationally among youth girls in the event. She is ranked 16th in the nation in the 3,000. The outstanding trackster was also a standout in the classroom at Saint Andrew's, where she was a member of the National Junior Honor Society. May is top-notch swimmer, too, and is among the best in her age group in the breaststroke. She combined her swimming and running talents with a solid performance on her bicycle to win her division at the Silicon Valley Triathlon held in June at De Anza College.